With Ketch A Fire, the Reality Shock producer Kris Kemist has distilled a gripping homage to the Digital Reggae of the 80's, using classics like Casio keyboard, Dx100 synth & Oberheim DMX drum machine. 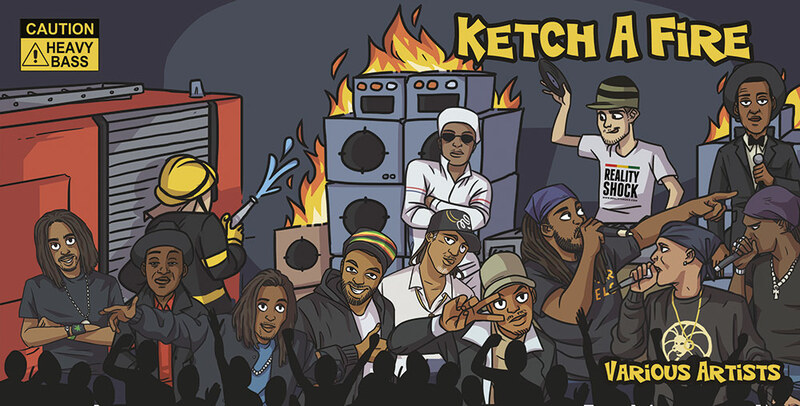 The result not only brings back the musical vibe of the era, but, by inviting a competent army of MCs to the voicing cabin, also the lyrical fire that sparked what has later become Dancehall. A first glimpse of these is given on the cover designed by Australian artist Herospy, which perfectly complements the style of the album from the firefighter who tries to extinguish the burning speakers to the artists involved, captured in typical pose and action. While most of them are well known (especially in the UK scene) some of the names are new-comers. Thus, I've never heard of Dixie Peach, who sets the pace appropriately with Digital Style, or of the Reggae General, who contributes two songs: Jamaica A Mi Yard, an ode to his far-away home, and Music Nowadays, an extremely well-ridden, driving riddim that criticizes what Dancehall has become. "All dem a talk bout is gun and killing (…) the music nowadays is just autotune crap!" Bimm! New to my ears as well is Mikey Murka, who even mentions that "nuff of them neva know I man" in Turn We Loose, a combination tune with the fantastic Birmingham-resident Speng Bond. This one is worth listening to a few times in a row, just to catch the critical irony wrapped up in the latter's words, e.g. "Maggi culture a go mash up the whole country!" (unfortunately, the Maggi cubes have become a staple in African and even Caribbean cooking, withal the brand is part of the reprehensible Nestlé company). Clever and humorous lyrics are one of the fun facts of the release anyway. Take Jah Screechy, for instance, with his "special request to all people who use their feet for their transportation" – Walkaton! He appears again in Roll Call, a rallying call to all UK singers and MC's (the seventeen names mentioned are all underlined with their own jingle!) and in the more serious Mad Banton. Further teachings are delivered by three artists whose tracks will scorch your speakers: Daddy Freddy in the pacy Strictly Reggae Music, King Kong with goose-bump-inducing vocals in Teach Dem and ever-ready Tippa Irie in the uplifting Moving Ahead. Instant classics, all three of them! Of course, the typical bragging and boasting is present as well. Thus, Errol Bellot clashes in My Sound and word-smith Solo Banton is so Full Of Lyrics that he needs two tracks to express them all; Super Lyrics, the second one, is the first singe release and already out on animated video! All the fun, drive and passion of the release as well as both lyrical and riddim-building mastery, though, is wrapped up in the entry. The Allstar Freestyle Medley brings the clenched power of Blackout JA, Bobo, Deadly Hunta, Solo Banton, Donovan Kingjay, Daddy Freddy, Tippa Irie and General Levy together to shell down the place! 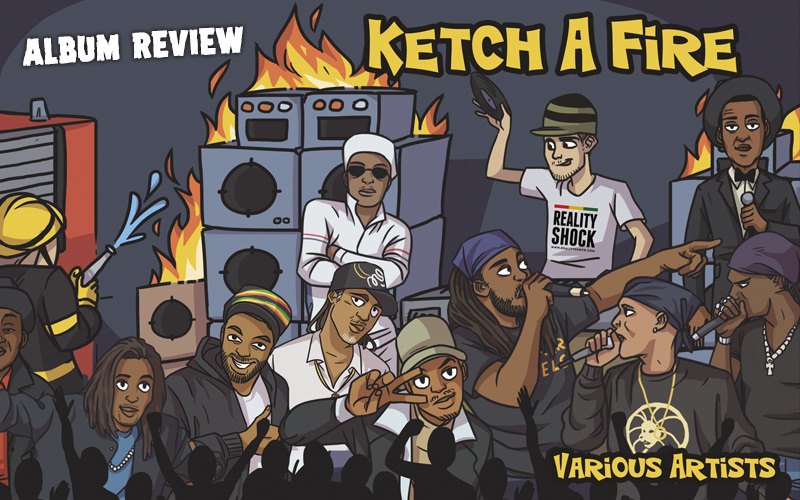 Topped off with four Dub versions, Ketch A Fire is a badly needed, style- and colourful contribution to the rather uni-directional Dancehall played up and down the recent dances, so all DJs take heed! Thank Kris for this album!